Our Future Rooted in Our Past: What in the World is PRONI? What in the World is PRONI? You might wonder what is PRONI? PRONI is short for The Public Record Office of Northern Ireland (PRONI). The PRONI is in the process of digitizing their vast holdings of records both public (school, Crown court, Coroner’s court, County Councils, Board of Guardians or Workhouses) and some privately donated records (Church Records, Diaries, Journals, Wills, Photographs). PRONI, a government organization was founded in 1923 shortly after the Four Courts Fire in Dublin during the Civil War of 1922 - 1923. The focus of PRONI was to gather records from the private sector to assist in filling in the gaps from the records that had been destroyed in the Four Courts fire. The first two databases are complete with the third database still in process. The original images are available for searching but require a DejaVU plug in to view the images. 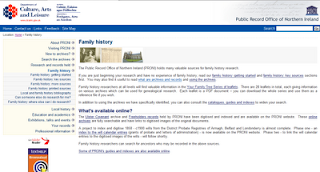 If you have Irish Ancestry and would like to research in these databases, click PRONI - Family History. Have fun!